Good morning all, temperatures are frigid this morning as most locations are starting in the lower teens. Highs today won't even break freezing, but a gradual warmup is expected throughout the week. We look to remain dry until Thursday afternoon, and this is when I expect our next round of rain to start. 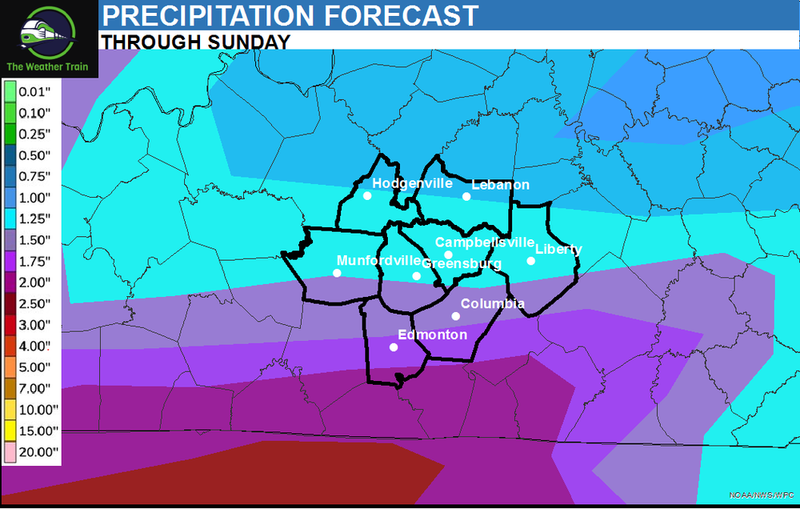 There look to be two waves of moderate rain that will impact central Kentucky this weekend. The first wave moves in on Friday, where rain chances will be near 70%. There looks to be a brief lull. In rainfall activity before another round runs in on Saturday into Saturday night. I'm keeping an eye on two things. 1. Rainfall amounts look to be between one and two inches, but models have been slowly increasing the potential for more. With all the flooding we have experienced, it won't take a lot of rain to cause issues. I've posted the updated precipitation maps below, as 3 inches are now forecasted in Tennessee. 2. The potential for some severe weather also exists on Saturday. There are still some details that need to be answered, but it's something I’m keeping an eye on. The Storm Prediction Center has already highlighted areas just to the south and west of Kentucky. Make sure you are monitoring the latest information, as this has the potential to bring severe weather to the area. In other news, the data in this department has changed drastically over the last 24 hours. The WPC is now projecting that our area will see above average temperatures over the next 6-10 days! Is spring actually here to stay? Time will tell! Stay warm, and enjoy the day!